Cucullia intermedia Speyer, 1870, Stettiner Ent. Zeit., 31:400. Cucullia cinderella Smith, 1892, Proc. U. S. Natl. Mus., 15:49, pl. 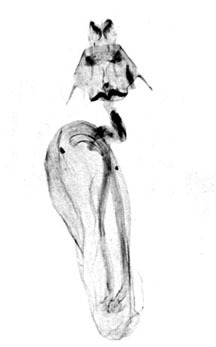 2, fig. 1 male valve. Diagnosis: Cucullia intermedia superficially resembles the various members of the speyeri complex. 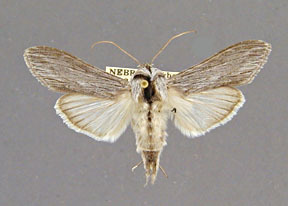 The forewing is uniform gray with little or no significant maculation. Two main differences separate intermedia from the species in the speyeri complex. 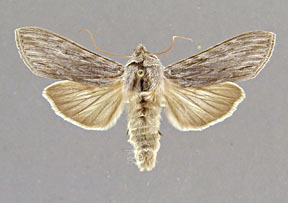 First, the hindwing is a uniform, medium brown color. The base of the hindwing (at least) is white in the speyeri complex and distinctly lighter than the outer margin. Indeed the male hindwing in the speyeri complex is almost always entirely white except for the outer margin. Second, the black streak in the forewing tornus of the speyeri complex is almost always absent in intermedia. 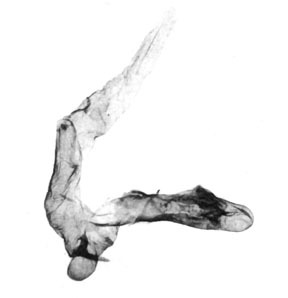 The male and female genitalia are described under the group heading. Cucullia intermedia is a close sister species of the Palearctic species Cucullia lucifuga [Denis and Schiffermüller]. In fact I suspect that the two are the same species. A couple of consistent differences exist, however, between the two species or populations. 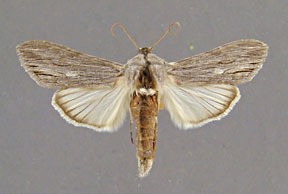 First, lucifuga is slightly darker and the maculation slightly more distinct than specimens of the North American species intermedia. A pale dot in the medial area between the inwardly pointing teeth of the antemedial and postmedial line exists in lucifuga, but is usually absent in intermedia. Secondly the vesica diverticulum without a spine is about twice as long as wide in intermedia, but approximately equal in length and width in lucifuga. The narrow portion of the ductus bursae tends to be longer and narrower in intermedia than in lucifuga. However the difference is not consistent because of variation in relative length and width in populations of intermedia. 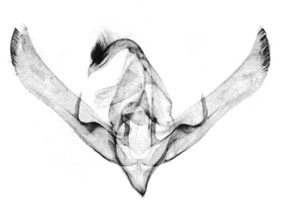 The clasper and basal process of the sacculus are slightly thinner and longer in intermedia than in lucifuga, but again the difference is not consistent. Cucullia intermedia has no close relatives in North America, but is one member of a large group of Old World species. 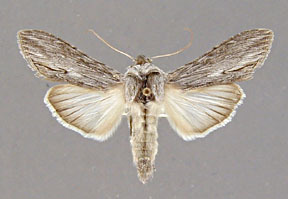 Cucullia intermedia and lucifuga may, or may not, be distinct populations of the same species. The key to delineating specific limits lies in the Old World, specifically Europe and Asia. For the moment I have made the decision to retain the North American entity as a separate species until the problem can be looked at in more detail. Wing length from base to apex: mean = 21.65 mm., standard deviation = 0.71 mm., n = 10. 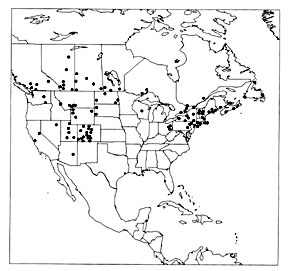 Distribution: Cucullia intermedia occurs in most of Canada and the northern United States. It ranges as far south as Pennsylvania in the east. In the west it reaches northern California. In the Rocky Mountains it stretches as far south as the White Mountains in east-central Arizona and occurs commonly in Utah, Colorado, and northeastern Nevada. A single specimen from Nevada is much lighter than any other specimen I have examined except for two unusually pale individuals from Newfoundland collected with normally colored specimens. The species is absent from the Great Plains region of the United States, except for North Dakota and western South Dakota, and is absent from the southeastern quarter of the United States. Adults have been collected in May, June, and July. Larva: I have not seen any preserved larvae. Through the courtesy of J.D. Lafontaine I have examined color slides of both third and last instar larvae reared from Lactuca canadensis Linnaeus. The last instar larva is dull black. The most conspicuous feature is a series of salmon-orange patches the side of the body near the spiracles. These patches are roughly rectangular on the thoracic segments, but become more ovate on the abdominal ones. There is a dorsal series of much smaller salmon-orange spots on the thoracic segments and the first two abdominal segments. The prolegs are black. The head is black with two small white spots in the adfrontal area. The third instar larva looks much different than the last instar larva. The third instar larva is also black, but a conspicuous cream-white dorsal line and a nearly white spiracular line are present. The head is black with conspicuous lateral white patches. Foodplants: Lintner (1876) records the larva of intermedia from Lactuca biennis (Asteraceae), commonly called tall blue lettuce. In a most perplexing foodplant switch, Prentice (1962) records lucifuga on white birch. I have seen the reared specimens and they are indeed this species. The species was collected 118 times from white birch so the record is unlikely to be accidental.